This local brand is taking one big step forward. (SPOT.ph) Stacks of dull-brown boxes are lined against the walls of a three-storey home in a relatively quiet street in Marikina. There’s leather everywhere. There are rolls of it piled on top of each other on a shelf. There are small scraps of it scattered on the tables, on the floor, and under the brightly lit workstations. 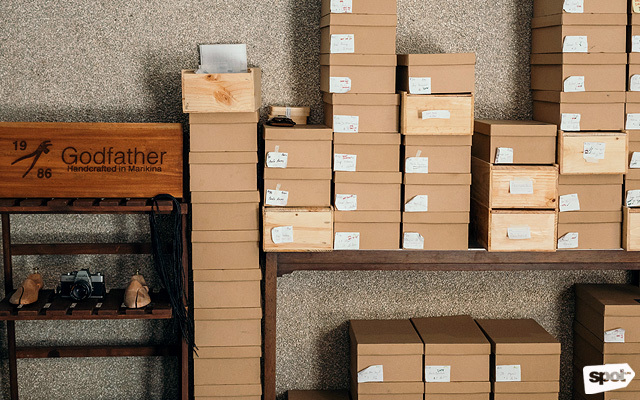 The showroom of Godfather Shoes also doubles (or triples, technically), as a common space for Gray Handcrafted Leather Goods and The Metal Gallery, a supplier of hardware needed for leather bags. 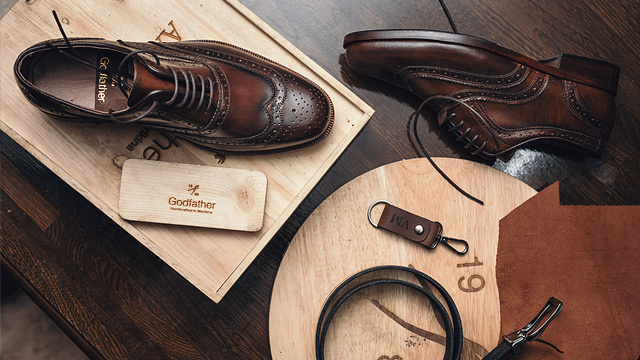 Godfather Shoes is only a year old, but with carefully finished shoes and laser-engraved products, they’re already making offers you can’t refuse. (Excuse the movie reference.) 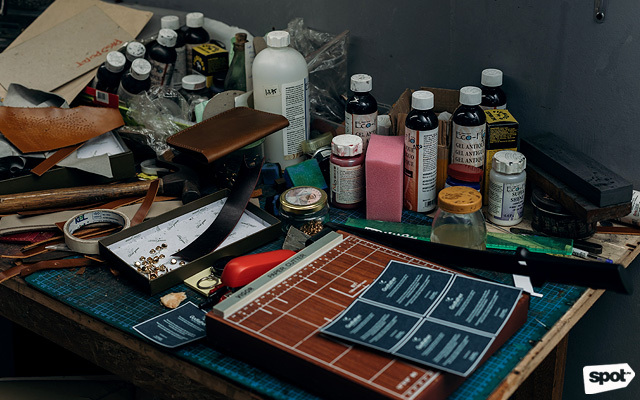 In an interview with SPOT.ph, Aaron Angeles, the brand’s founder, shares how the literally homegrown—he used to just work from his house—brand is quickly becoming one of Marikina’s most notable labels. And it all started with him quitting his nine-to-five job. “I was an employee before but I didn’t see the value of my work at the bank. So I ventured to Marikina to check what was here. 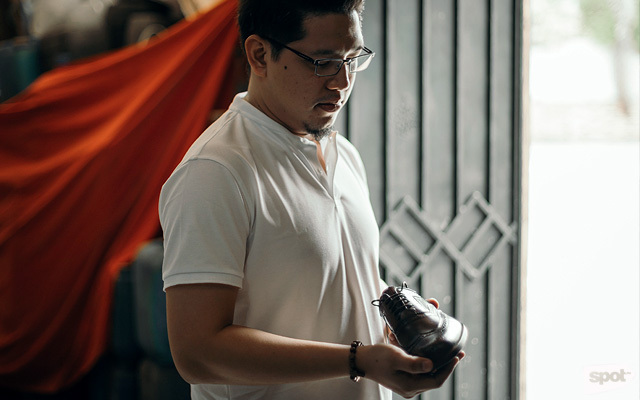 For decades, Marikina was known for shoes but based on what I saw, bumagsak 'yong Marikina and I wanted to see why,” he recalls. 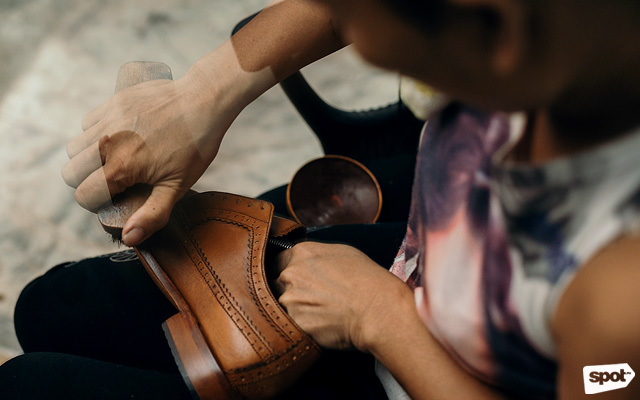 What he found was that while Marikina shoes are exceptionally sturdy and well-made, there seems to be a lack in their proper finishing, branding, and marketing. “The business model that Marikina was used to was just to produce and sell—then that’s it, tapos!” He saw the need to create a sense of special ownership for the pairs. “I personally like seeing my name on the shoes but I couldn’t find [a place] where you can do that. You'd find names on the shoes, but they're not yours. They're names of famous people.” he shares. So, with P5,000 and a barely there blueprint of what he had planned, he bought all of the components needed to make shoes. He came up with five pairs which he then sold to his friends and family. 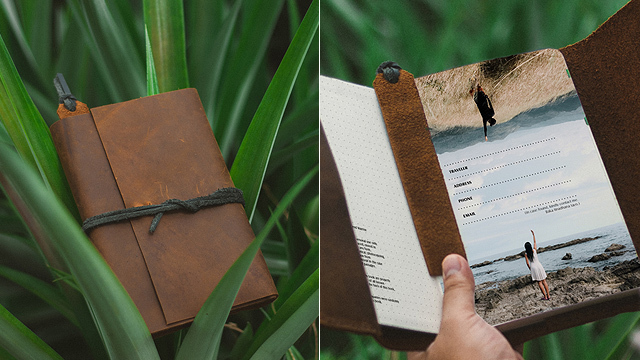 He then began thinking of brand names with his wife and the brand’s co-founder, Ayn. They wanted to create something that had the potential to go beyond not just Marikina, but also beyond the Philippines. “We thought of a brand wherein the logo and the name would create an impact not only here in the country. Even if you brought it outside of the country, it would be at par with the international brands,” he says. And so, Godfather—and the logo bearing the year “1986” with a pair of pliers in the middle—was born. The pliers in the logo are actually what local sapateros use the most when crafting a leather shoe. As for the year, he says, "For me, it's my calling, so it started when I was born." 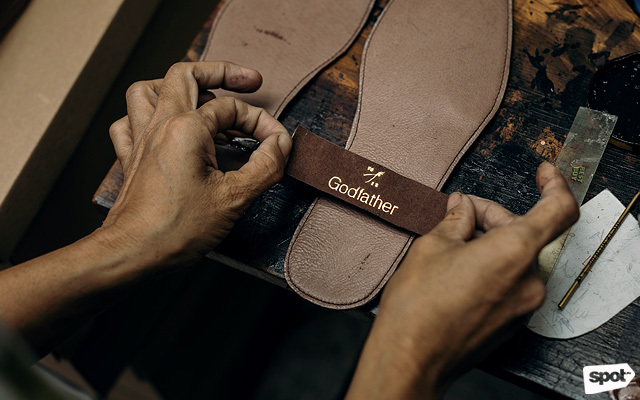 So how exactly is a pair of Godfather Shoes made? 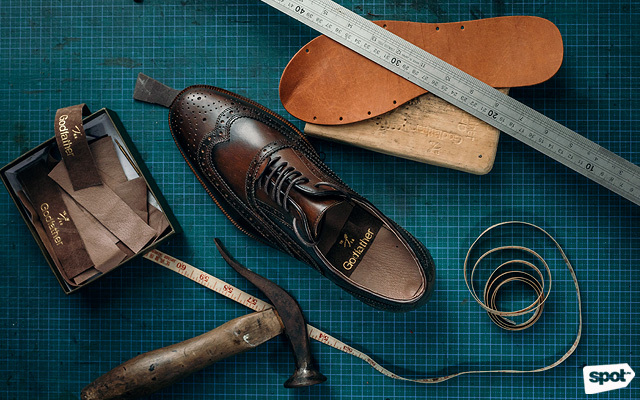 The orders go directly to a shoe factory. The styles and designs are carefully curated from ongoing trends both locally and internationally. 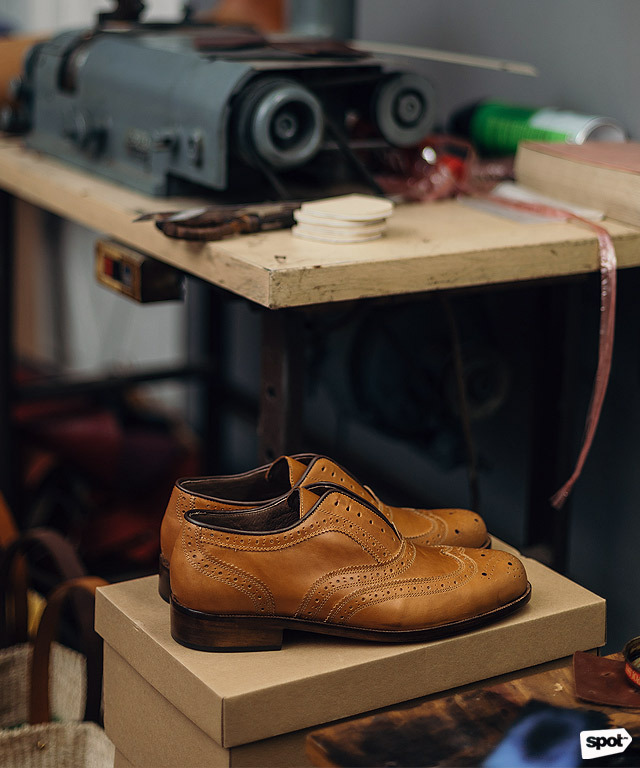 “One pair can be created in two days, but since there are a lot of orders, the lead time gets extended because we make everything at the same time,” he explains. This means that a whole batch of orders of around 30 pairs can be made in two weeks. 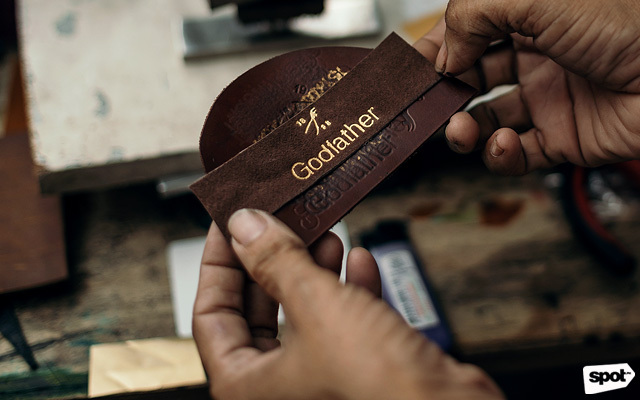 The “raw” shoes are then brought to Godfather’s HQ where it undergoes the finishing touches, which is essentially like putting makeup on the shoes. 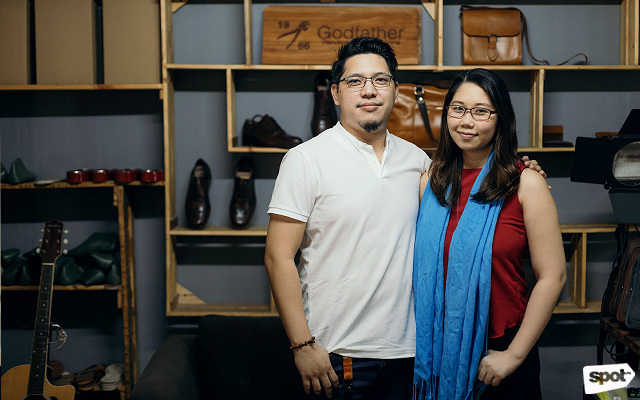 “For so long, what they know here in Marikina is to make shoes without makeup. If there is makeup, it’s not well-made, I would say.” It took Aaron more than a couple of tries to get the formula for the paint just right. 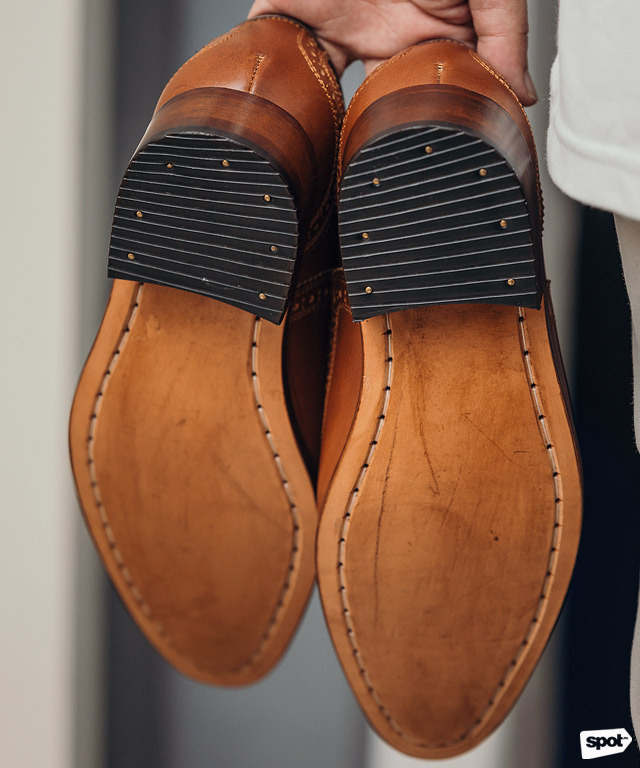 “At first, I looked at how they finished shoes. 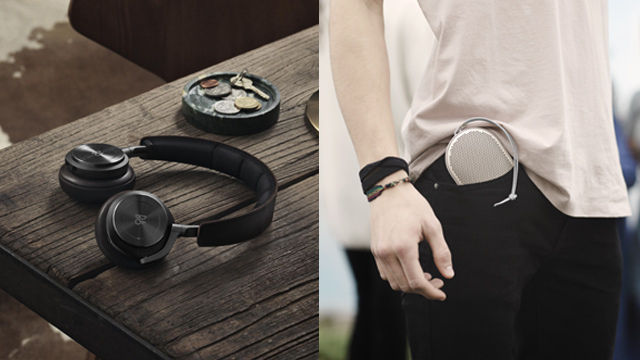 I discovered that the materials are being used in a wrong way,” he reveals. So he experimented. 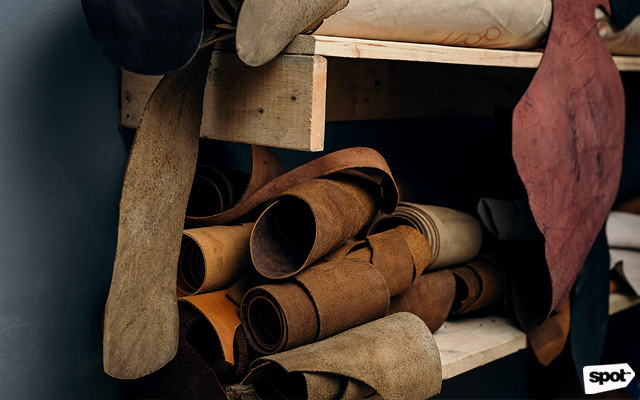 He looked for the best consistency of the paint, he found out what effect the paint had on leather if a different kind of foam or brush was used, and went through several mixtures until he got it perfectly. 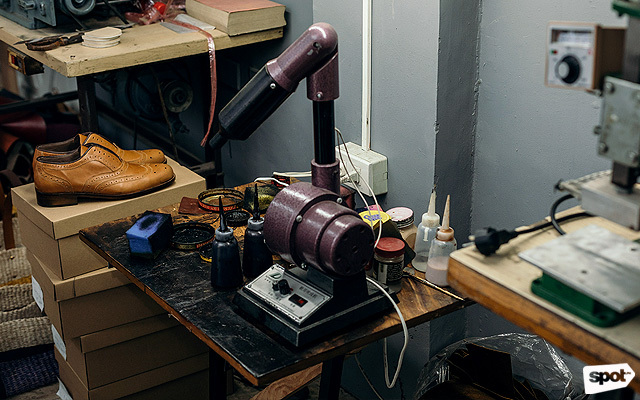 The shoes undergo three stages of paint before they’re finally ready to be engraved. 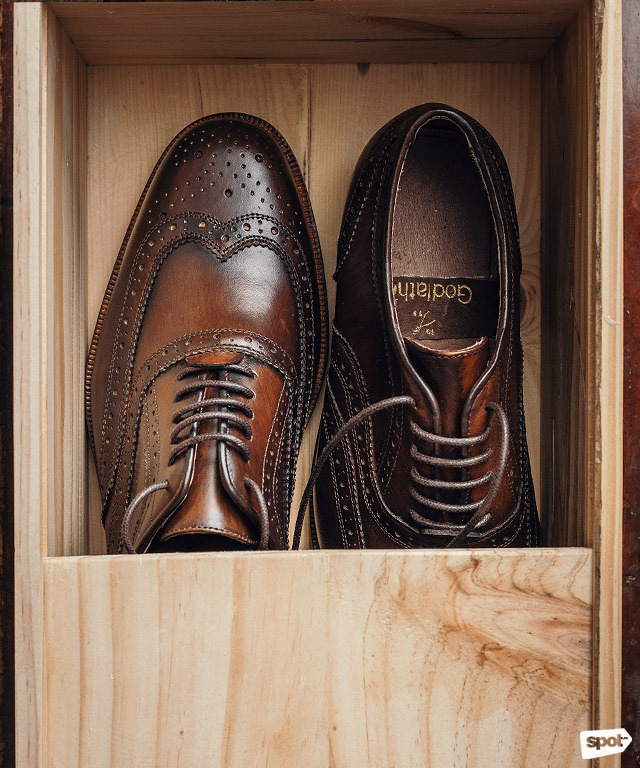 Even the shoes' wooden box can be engraved with a name, a logo, or a message. “It’s a different experience for the recipient,” Aaron says. 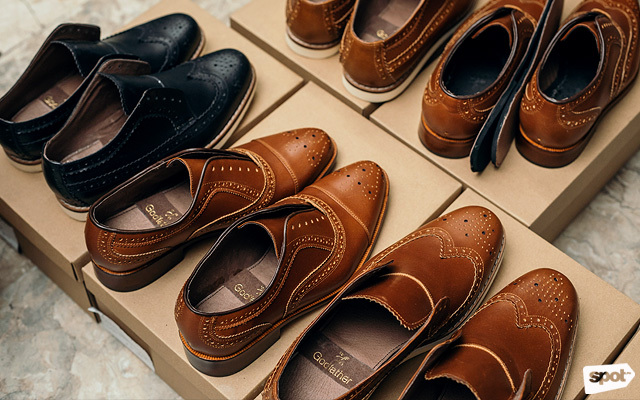 He then checks the shoes one by one to ensure that they’re in the best possible condition before they’re shipped off or before the client picks them up. 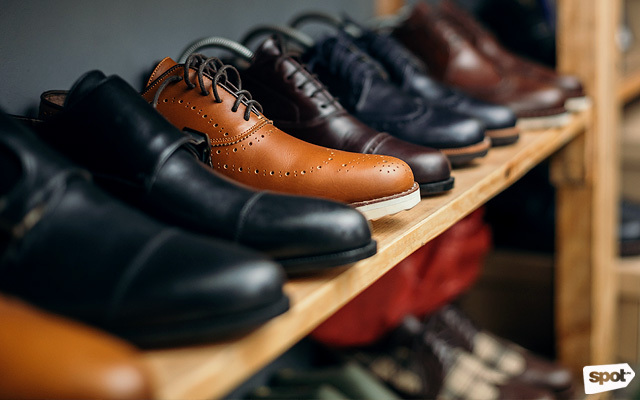 With properly finished shoes and customized details, it’s no wonder online order forms fill up quickly and production is constantly at full speed. 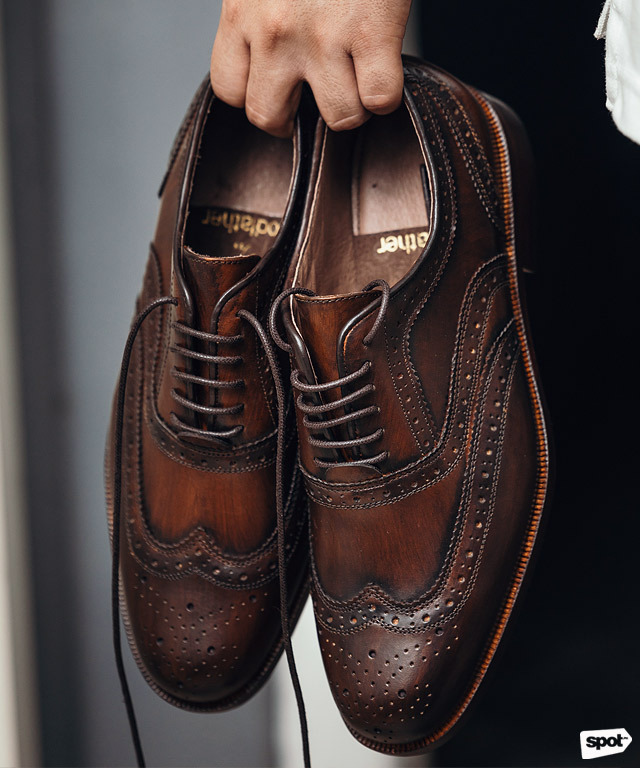 Those who aren’t so keen on spending P20,000 to P30,000 on a pair of shoes will gladly go for something equally as good (or even better) for only a quarter of the price. 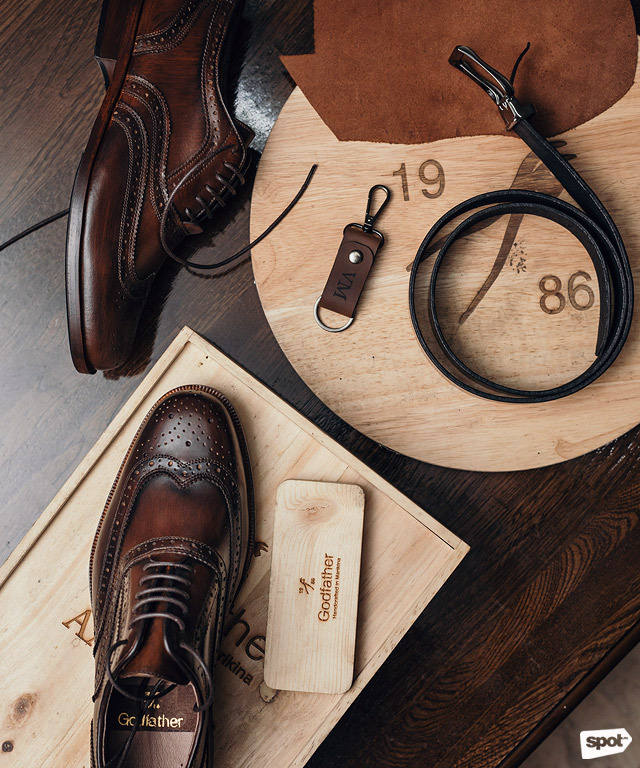 The price for a pair of Godfather Shoes starts at P5,700, while P20,000 can already get you two pairs along with a couple of leather accessories. 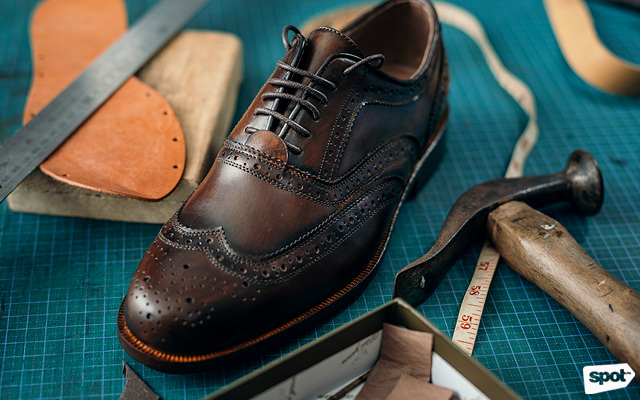 Aaron also plans on expanding Godfather Shoes to sell brushes, polishes, and other shoe-care products to help maintain the quality of the shoes. But even if the business is booming, he says anyone could have easily done what he did. What's even more important is how it's helping Marikina’s renowned sapateros flourish again. “I think with what we’re doing, kahit papano, I can show them the opportunity that they have. I can show the kids that they can finally continue what their parents have been doing. Hopefully this time, makikita nila 'yong change,” he shares. Godfather Shoes is at 2 Falcon Street corner Flamingo Street, Marikina City. For more information, visit Godfather Shoes' Facebook page.